Rick Coleman, Fats Domino’s biographer and author of Blue Monday: Fats Domino and The Lost Dawn of Rock ‘n’ Roll, is among the interviewees in the film Fats Domino and the Birth of Rock N’ Roll. Coleman has been writing about New Orleans music for the past 35 years, with his work appearing appearing locally and in Rolling Stone and Billboard. 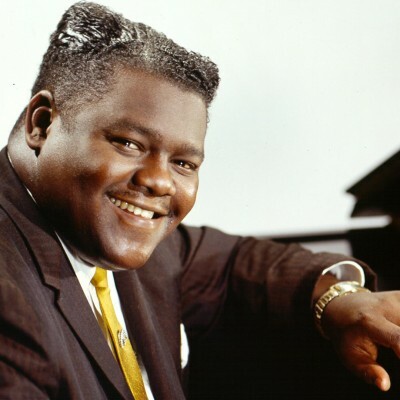 Blue Monday: Fats Domino and the Lost Dawn of Rock ‘n’ Roll won the ASCAP Deems Taylor-Timothy White award for outstanding musical biography of 2007. Coleman is working on an extensive history of New Orleans music. Over the holidays there were lines at movie box offices across America, where marquees proclaimed Hollywood spectaculars: Oklahoma, The Ten Commandments, Around the World in 80 Days, Lust for Life, Anastasia . . . Three controversial films, The Girl Can’t Help It, Shake, Rattle and Rock! and Baby Doll, incredibly featured singers — Fats Domino, Little Richard, Joe Turner, and Smiley Lewis — who were veterans of Cosimo’s studio and hole-in-the-wall New Orleans nightclubs. After The Ed Sullivan Show and his appearance in two movies, Domino was becoming a superstar. On January 19, “Blueberry Hill” reached its pop peak at #2 for two weeks on the Billboard Juke Box chart behind “Singing the Blues” by pop singer Guy Mitchell. After the record’s eleventh week at #1 in the r&b charts, “Blue Monday” replaced it at the top. Lew Chudd bought an impressive four pages in Billboard to advertise Domino’s twelve gold records and attendance records broken in twenty-one cities. Imperial sold two million records in January, a million and a half in February — the vast majority of them 45 and 78 rpm singles by Domino. Though white adults rarely bought albums by black singers, except artists like Nat “King” Cole or Harry Belafonte who were essentially singing pop, Domino’s second album, Rock and Rollin’, invaded the snow-white pop album charts, reaching #18. It was followed by This Is Fats Domino, which hit #19. In New York, BMI held the first “Rhythm & Blues Awards” luncheon on January 23 to celebrate blowing away ASCAP. Domino and [Dave] Bartholomew won six “citations of achievement” for their hits, the most of any songwriters. Fats also did great business for ASCAP with his revivals of old standards. Fats was wide-eyed with pride as he flipped through his five-page “King of Rock ’n’ Roll” layout in Ebony. The article rolled up the figures of his success: 340 days a year on the road, up to $2,500 a night to perform, over $500,000 gross income in 1956, fifty suits, 100 pairs of shoes, a $1,500 diamond horseshoe stick pin, and a $200 monthly phone bill from calling Rosemary daily. Pictures also told his story: crowds jostling to beat the fire marshal’s audience limit, whites mixing with blacks, and the broken bottles and splintered chairs of the Newport and Fayetteville riots. But there were a couple of sour notes in the midst of the coronation. George Oliver, owner of a Ninth Ward bar, the Jail Drop, talked Fats into going to the all-black Gallo Theater to see The Girl Can’t Help It, which had premiered downtown at the segregated Saenger Theater. There was no red-carpet treatment for Domino. “I don’t guess nobody knew I was there,” says Fats. At the same time, he canceled a stay locally at the all-white Safari Room on Gentilly Highway when he found out that the management expected him to dress in a trailer behind the club instead of giving him a dressing room. On January 3 Domino recorded a session in Cosimo’s studio that included “I’m Walkin’,” a song that added fuel to his fire. Bartholomew challenged Earl Palmer to come up with a different beat. Following Domino’s unique two-beat piano, the drummer added his own parade rhythms. “Fats was a hell of a lot better musician than people give him credit for,” says Palmer. “He had a lot of original thoughts and they were all creative.” Palmer pumped a bass drum introduction that harked back a generation to the parade beat of Little Jim Mukes with the Eureka Brass Band. Then he started a steaming snare two-beat. Papoose Nelson played a scintillating guitar riff, with a tuba bass pattern accelerating to double-time. He also added a crucial sixth note. Frank Fields blended his bass between the guitar and Domino’s rumbling left hand. Bartholomew wasn’t satisfied. He told Matassa he needed more bottom. “I can’t give it to you, I’m overloaded now,” replied the engineer. The musicians soon kicked off on an exhilarating second line parade rhythm with an extended solo by Herb Hardesty. 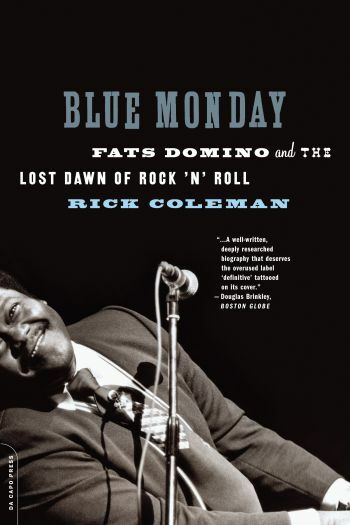 From Blue Monday: Fats Domino and the Lost Dawn of Rock ‘n’ Roll by Rick Coleman. Reprinted courtesy of Da Capo Press.